In the copycat world of European passenger aviation, Executives at both LH Group and Air France-KLM have embraced the ‘inevitable’ need for a LCC to compete with Ryanair, easyJet, Vueling, Wizzair and Norwegian Shuttle. As mentioned in an earlier blog this month, AF-KLM are seeking to ramp up their LCC subsidiary – Transavia – to copy Germanwings – Lufthansa’s LCC experiment. For their part the German pilots’ union Vereinigung Cockpit (VC) took industrial action against changes to the pilots’ contract that would allow Lufthansa to end an early retirement scheme that allows pilots to retire at 55 and still receive up to 60 percent of their pay until state pension payments kick in. A three-day strike by VC pilots at Lufthansa earlier in 2014 over the same issue grounded the airline and wiped 60 million euros off LH Passenger Airlines’ H1 profits. Things got worse for LH Group executives. When LH acquired the permanently failing Austrian Airlines in 2009, they terminated labour contracts held with Austrian Airlines as the company was transferred into ownership of Tyrolean Airlines – a former subsidiary of Austrian through a ‘hive down’. On September 11, 2014, the European Court of Justice (ECJ) ruled that collective wage agreements also apply to labour contracts even after a transfer of operations of the kind undertaken at Austrian Airlines in what appeared to be a setback to the management’s cost-cutting plans. The transfer of about 2,000 pilots and flight attendants to Tyrolean, where contracts are less generous, was a key element in the restructuring plans the loss-making Austrian Airlines. The airline’s works council wants negotiations to be based on the old Austrian Airlines collective agreement. The company wants to negotiate on the basis of the less-generous Tyrolean contracts. In the light of the ECJ ruling, the works council called emergency meetings to discuss the decision leading to the cancellation of 15 flights on September 18. So is this a last stand before the ‘inevitable logic’ of de-regulation forces airlines to take drastic action against their pilots or are the pilots equally powerful players in the negotiation? In a European context, the pilots have much going for them. They are much harder to dismiss than in other countries because of the strong social and labour protections afforded them. By refusing to fly, they can ruin an airline executive’s unimaginative plan to copy their competitors i.e. eroding benefits to employees and value to customers. The airlines can’t just replace them as they could in other countries by using insolvency or bankruptcy laws that allow for ‘restructuring’ as the ECJ ruling against LH Group shows. The pilots are not listening – the strike is now in its second week, effectively grounding 60 percent of flights – including the lucrative long-haul market that garnered 800m Euros for Air France-KLM in 2013/14. 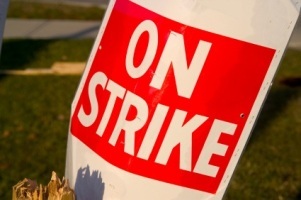 Apparently the pilots’ union has said that the strike is of “unlimited duration”. AF-KLM and LH Group’s industrial relations strategy is likely to get uglier before it gets prettier.